Don’t let that happen. Stop using Desktop. It is easy to say that. But EXACTLY how to stop using it? 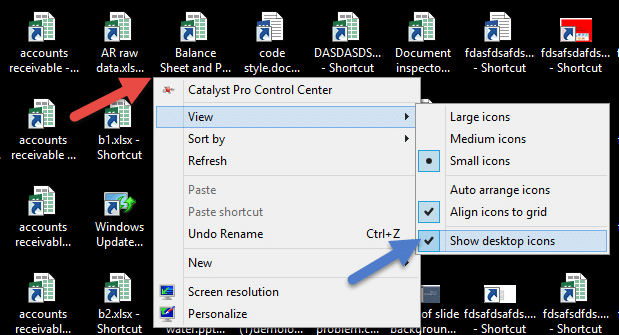 Right click on any empty area on the desktop. I know it is difficult but there is a way… Right click in the area shown by the red arrow. Choose the option shown by blue arrow. What to do with the empty desktop? Press it again to come back to where you were. Windows 7 onwards the rightmost area of the taskbar can also be used to view desktop quickly. Hover the mouse cursor over the area shown with Yellow arrow. It should show desktop automatically. If you move the cursor away, you are back to where you were. If this does NOT happen, try a click in that area. Desktop will be shown. Another click will get you back. How to use the desktop for learning? General idea is this. Create an image containing whatever you want to learn. Set it as the desktop background. Why not use Desktop to save files? Actually I was not going to write this section at all. Because, I am sure all of you have faced all kinds of problems due to this bad habit. Files are shown as ICONS by default. Filenames are very long. So it is impossible to see the full filename. This leads to confusion because you often end up opening the wrong file or the wrong version of the right file. Pathetic! Although Desktop is just a file folder, it was originally designed for invoking common applications. 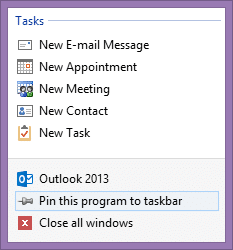 Now you have much simpler methods of starting common applications by using the Pin to Taskbar method. Saving to desktop is like saving all files to a SINGLE folder. Obviously, all kinds of files get mixed up leading to more and more confusion – finally leading to complete CHAOS. I am sure there are more problems … but I guess this much is enough to convince you ! Thanks for sharing this one Dr. Paranjape…. I did clean up the desktop finally and am replacing with the Wall paper you shared:-) Hope to see better days ahead. Great. Let me know your feedback.